Here's an interesting art object I found earlier this week. Based on the fact that it hangs and has two Buddhist bells at the bottom, my only conclusion is that it's most likely a wind chime. 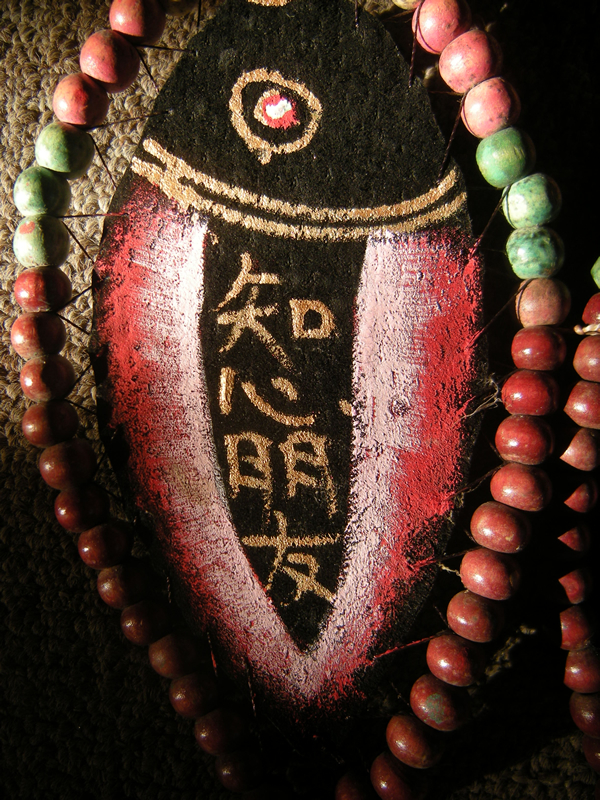 The overall look and appearance looks like Tibetan hand craft to me, however, the writing on the double fish as well as on the Buddhist bells is Chinese and I'm not sure at this point if that rules out the possibility of this artwork being Tibetan hand craft. 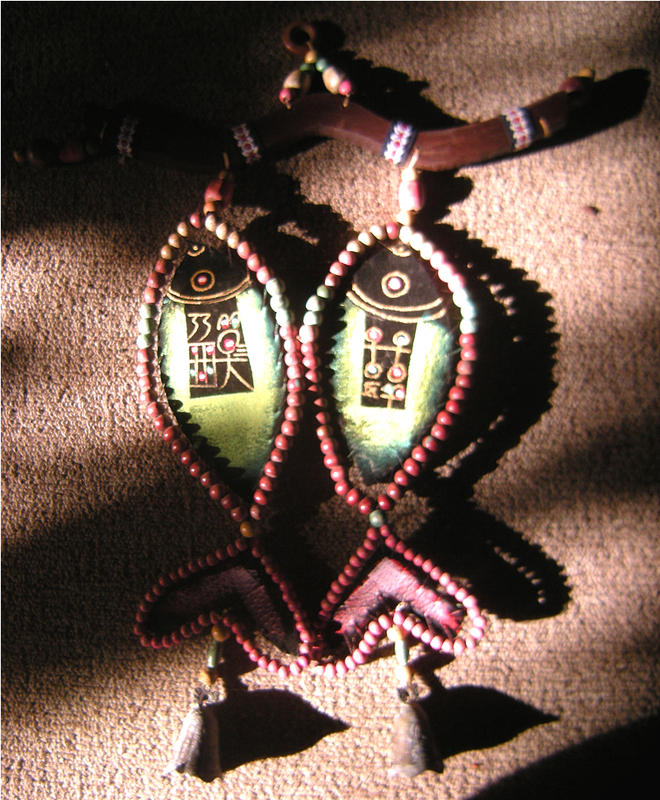 The bodies of the double fish are made of leather, which are framed by vegetable dyed wood and/or seed based beads. Both sides of the fish bodies are painted and have Chinese writing on them, which I haven't had translated yet. 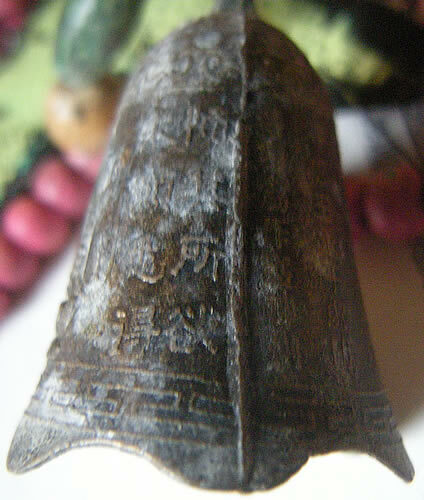 One side is written in regular script, the other in symbols which appear to be akin to oracle bone script. 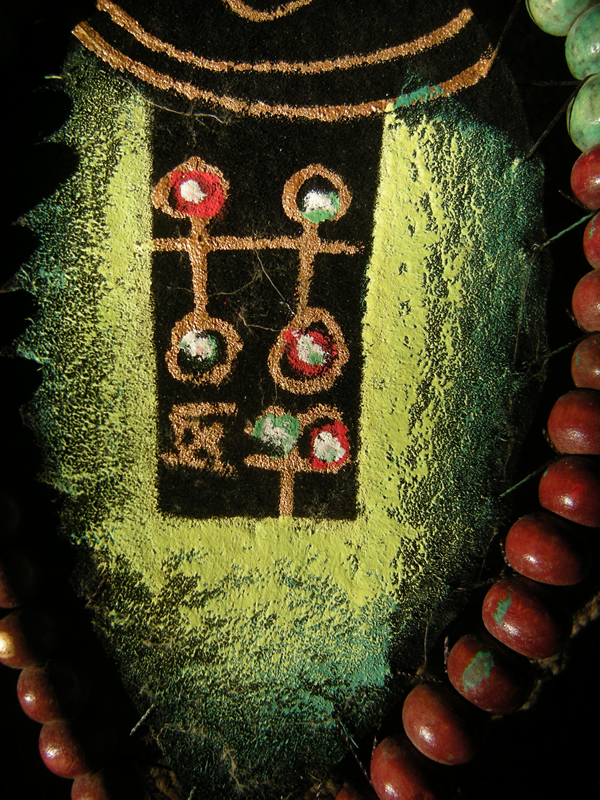 One one side, seen in the photo above, the double fish's bodies are painted pink and red, with bright green tails. On the opposite side, shown in the photo below, the double fish have bright green bodies and bright red/pink tails. 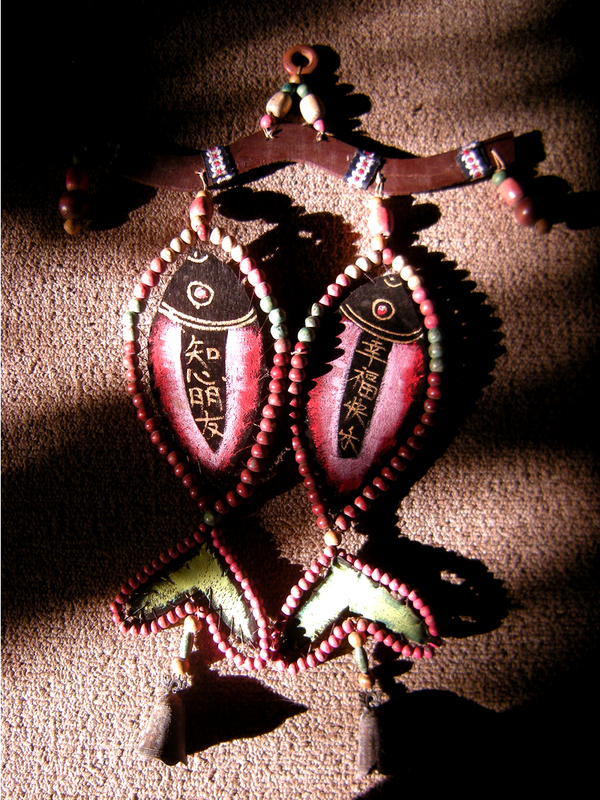 I am doubtful that this "Buddhist" double fish "wind chime" is that old due to the colors used in the paint, however, according to a website called "Something Awful", neon colors were invented in the nineteenth century. My best guess is that this piece is most likely late 20th century and is a one of a kind hand crafted item by a Chinese artisan, however, I know nothing whatsoever of its origins or who made it. 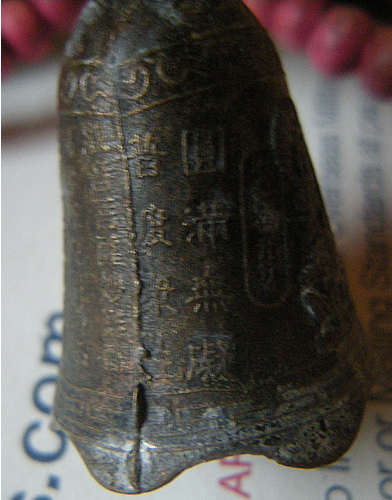 I'd love to know what the text says, so if anyone reading this post reads Chinese, I'd greatly appreciate your help. 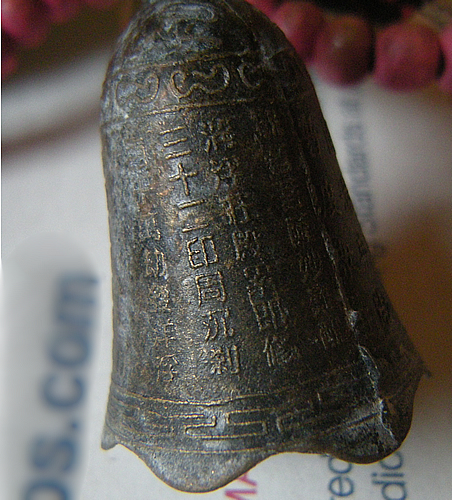 It wasn't until I got home after purchasing this and looked at the bells with a magnifying glass that I noticed the Buddha and the inscriptions on the bell and it's unlikely I'll be able to get a translation for the inscription on the bell until I can provide better photographs of the Buddhist bells. 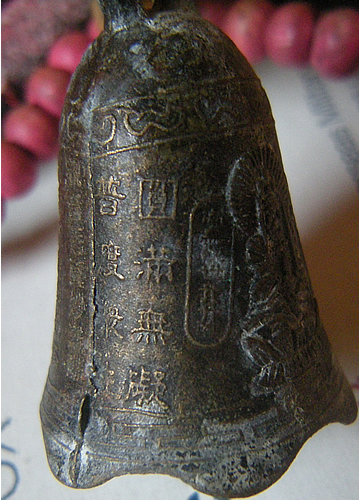 One of the bells, unfortunately, is now nothing more than a broken, jagged, Chinese puzzle since just now as I was writing this post, I began re-examining it again to get a feel for what type of metal it is in order to better describe it, and as I gently squeezed, it shattered into multiple fractured pieces, which rules out bronze or brass and confirms my assumption that the bells are made of cheap, crappy pot metal. Neither of the two bells had a clapper. 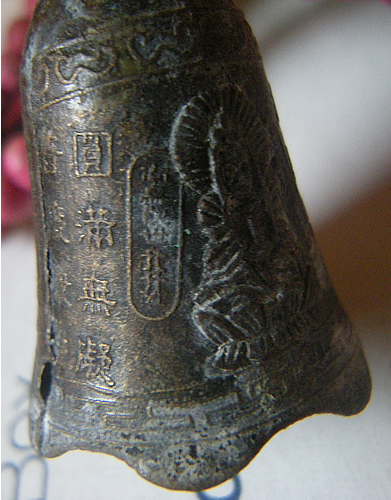 Whether or not they originally had one, I do not know, but looking inside the remaining bell that's still intact, it appears very likely. 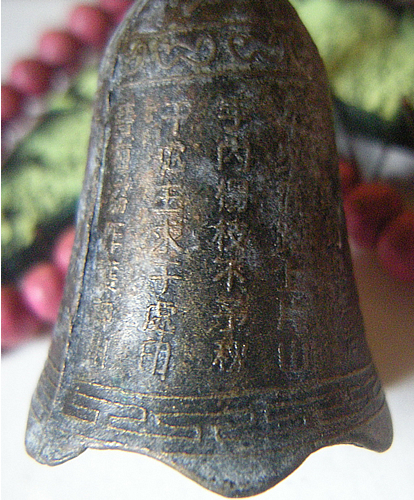 I'm very disappointed about the bell being broken and am not confident I will be able to piece it back together, so suppose I should begin looking for a replacement, preferably a pair. Here's photos of the Chinese Buddhist bells that hang on the bottom of the double fish wind chime, along with my new Chinese puzzle. :(. After discovering the Buddhist bells on the double fish "wind chime", I learned that the double fish symbol has some significance in Buddhism, as well as Chinese Feng Shui and folklore, however, in these, the double fish are golden, which is not the case for my double fish wind chime, so I'm a bit perplexed about this. Insofar as double golden fish go, in Tibetan Buddhism, the golden double fish symbol is one of the Eight Auspicious Symbols. These have their origins in the two sacred rivers of India the Ganges and the Yamuna. Symbolically, these rivers signify the lunar and solar channels of the human body, originating in the nostrils and carrying the alternating rhythms of breath, or chi, also known as prana. So the golden fishes bring life and happiness. They represent fertility and abundance as they multiply rapidly. Fish often swim in pairs, and in China, a pair of fish signifies conjugal fidelity and unity. Giving a pair of fish as a wedding present is regarded as very auspicious. This signifies a fervent wish for the couple to find happiness together and be blessed with many children. The Chinese word for fish yu also means great wealth, so material prosperity is also wished for the couple. The fish used in the symbolism here is usually the carp, which is regarded as sacred to many Asian cultures because of its beauty, its size and its long lifespan. In India and Tibet, the golden carp is regarded as being exceptionally auspicious. Even in ancient Egypt, a pair of fish is regarded as a sacred icon as it symbolizes the life - bringing waters of the River Nile. Having fish in one’s home especially in pairs is thus very auspicious. In general, The golden fish symbolizes the auspiciousness of all living beings in a state of fearlessness, without danger of drowning in the ocean of sufferings, and migrating from place to place freely and spontaneously, just as fish swim freely without fear through water. In feng shui and for oriental traditions, the fish is a very symbolic creature which represents abundance and wealth. Having fishes in the kitchen is a great way of helping abundance and provisions to be always present in the house. Feng shui practitioners recommend having fishes and double fishes in the kitchen or the living room in order to make sure that those who inhabit the house will always have what they need. Yu, which means fish, phonetically matches the word for abundance, which might be a coincidence but is very symbolic as well. It is very common to see objects representing fishes in many Chinese houses, most of the times in the kitchen but sometimes in the living rooms as well. Fishes are abundant in the sea and provide us an unlimited source of nourishment and supplies. It is a natural source of human sustenance which can be found in abundant amounts. Therefore, they are an abundant creature itself and its symbolism might be highly due to this aspect of their nature. 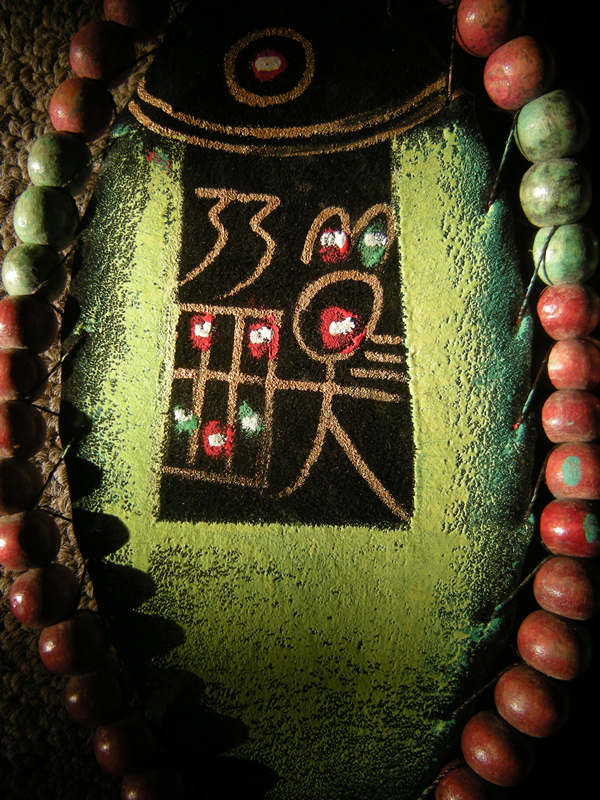 Besides all what was mentioned above, a fish is also seen as a symbol of fertility. Fishes have notable abilities for reproduction which makes them an ideal icon for symbolizing fertility. They are always together and travel as a team which makes them also symbolize unity and marriage. A fish is also a symbol of life renewal. This creature survives all times and époques and is always there for other beings to nurture from them. They are constantly renewing and giving birth to next generations, and this is seen by the oriental cultures as a great symbol of life preservation and regeneration. They show strength and are seen as representing a power for restoration and revival as well as rejuvenation and the power of continuation through time. Double fishes represent unity, marriage and abundance not only in food provisions but also in children and family in general. Having double fishes in the living room or the room in which the family gathers to eat is a great way of assuring abundance in all aspects and for all the family members. 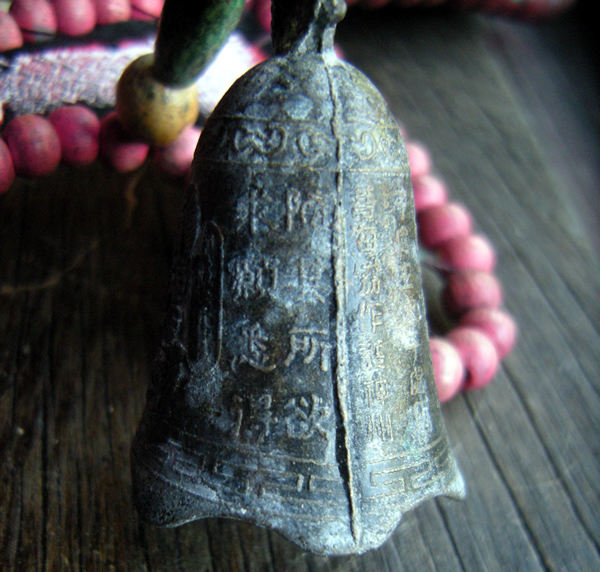 In an article titled Wooden fish gongs and wind chimes: Symbols of Buddhist cultivation, author Chun Ock-bae states that "The origin of the use of the fish in Buddhism is unknown: one version tells that a fish always has its eyes open day and night; thus it is a reminder to always be aware." 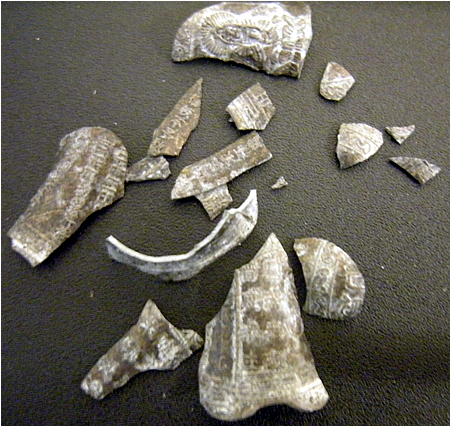 Further on in the article, after discussing Moktak, he discusses fish wind chimes. 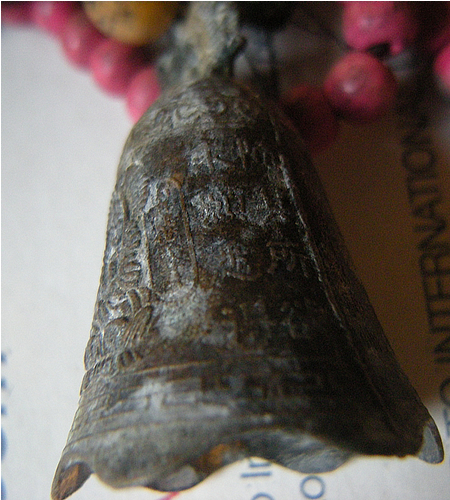 "Fish wind chimes are found on the eaves of Buddhist halls and pagodas. The wind rings the chimes, awakening the monks and nuns. Practitioners, like the fish who are always aware in the sea, practice to continuously cultivate themselves, even in their dreams. 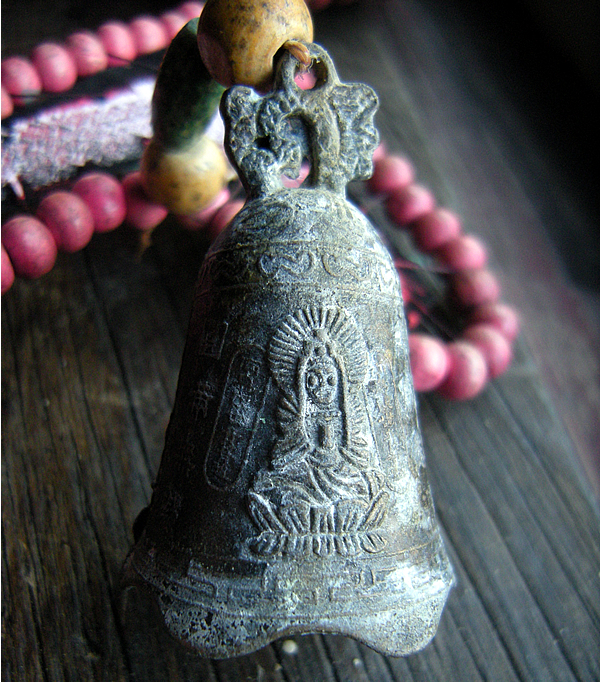 The wind in the chimes is likened to the condition of complete freedom from obstruction. 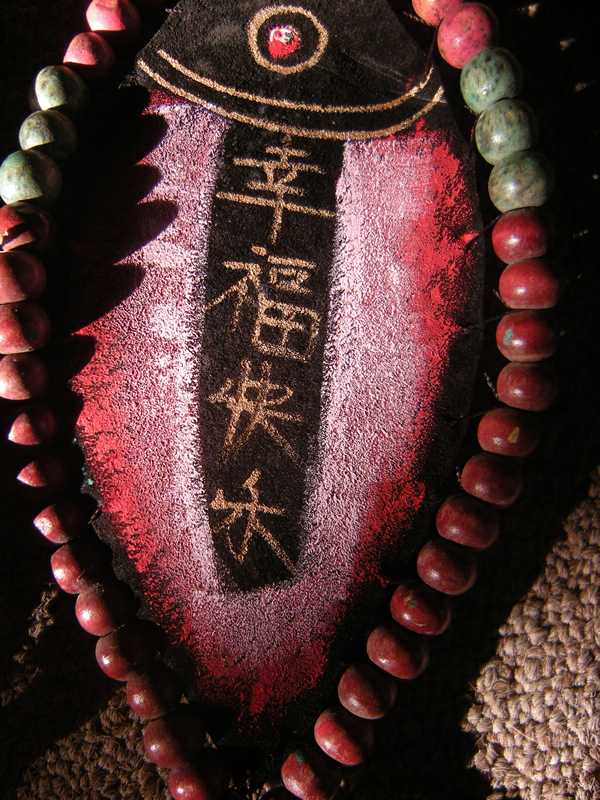 In one of his former lives, Sakyamuni Buddha followed bodhisattva practices while dwelling in the sea. There he witnessed a large fish preying on smaller ones, which in turn, did the same with still smaller ones. So Sakyamuni caught and ate the biggest fish, sparing the life of the small fish. This Sakyamuni's soul was transformed into the king of the ``makaras'' (a mythical animal with the trunk of an elephant, the front legs of a lion, and the body of a crocodile) with a massive body measuring several ``li'' (a distance of about 400 meters). At that time, famine had struck the land by the sea and people were turning to cannibalism. A huge makara, Sakyamuni beached himself on the shore and offered himself up as food, thereby saving the people from starvation." Whether or not if any of the above is applicable to the double fish wind chime I have, I am not sure, but it is interesting to learn about nonetheless since I find these sorts of things enlightening, fascinating, and interesting. 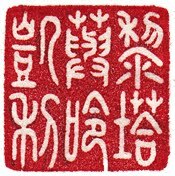 If anyone reading this could tell me more about my double fish wind chime, or help with translation, etc, feel free to comment below.